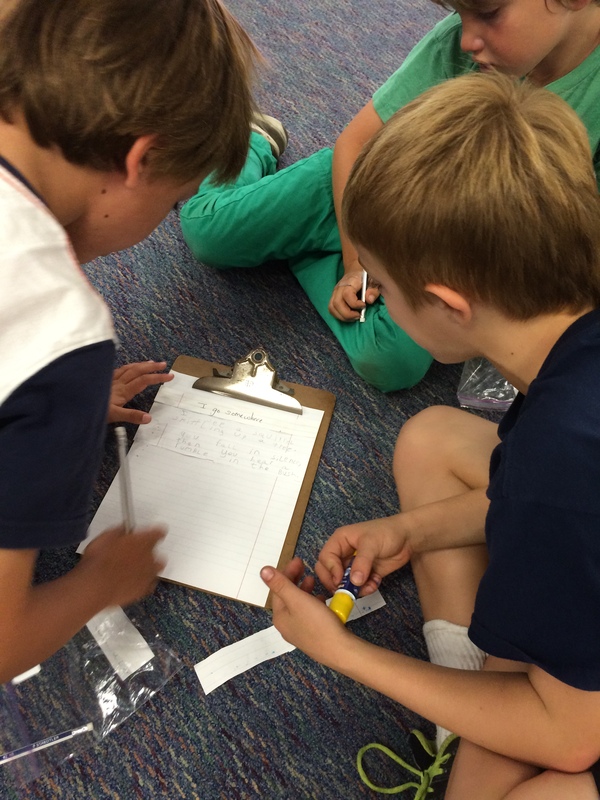 We are writers…and today we celebrated writing. I teach in a pretty unique situation, in a multiage class of first, second, and third graders. I co-teach this class with another amazing teacher and we keep our students for three years. We are not merely teachers and students, we are a learning community. 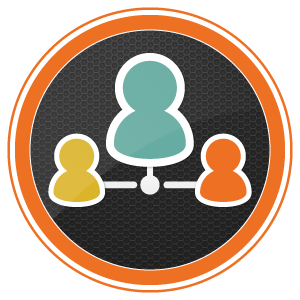 We support each other, challenge each other, learning together over an extended period of time. As 80+ students headed into the auditorium, they each had a part of an animal picture to match to find their cross-age partner(s). After spending a few minutes getting to know one another, partners were ready to begin a collaborative writing activity. Believing that writers write best from abundance, last week students in both our classes drafted some poetry. Our students had studied some poetry mentor texts from some of our favorite poets including Kristine O’Connell George and Valerie Worth and then, considering things they care about and know about, set off to write some poetry. Once drafted, they separated their poems into individual lines and then cut the lines apart to store in a baggie. The other class used a similar process and came to our event today with lines of poetry in a baggie as well. 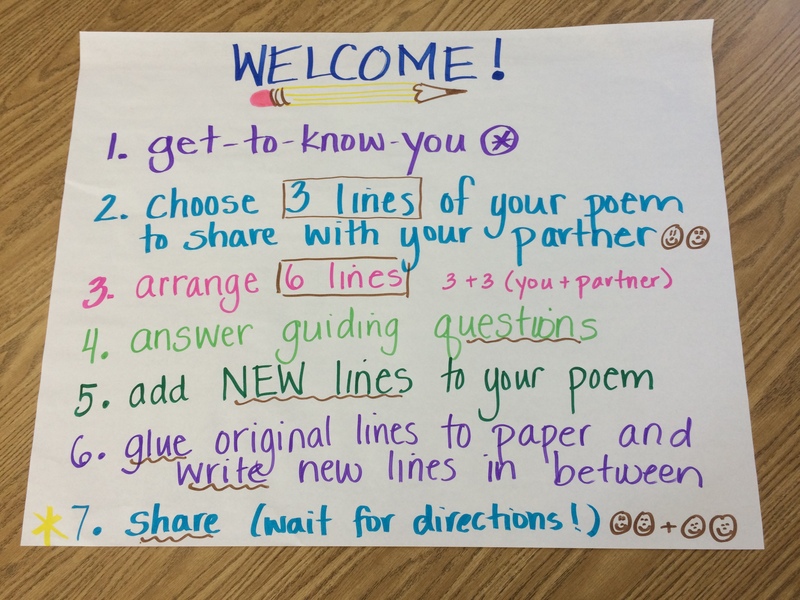 After getting to know each other, students pulled three lines from their poem from the baggie to share with their partner and after reading and listening to the six lines of poetry, decided how to build on those ideas to create a collaborative poem representing the partnership. A hush fell over the room as poets set to work negotiating and collaborating, crafting poetry together. And even though the room was full, it was if each partnership worked in a bubble of creativity and focus of their own. And it wasn’t long before drafts were prepared…and the writers were ready to go public with their poems. We headed out…beyond the school gate…to the sidewalk outside of our school, out into the community. 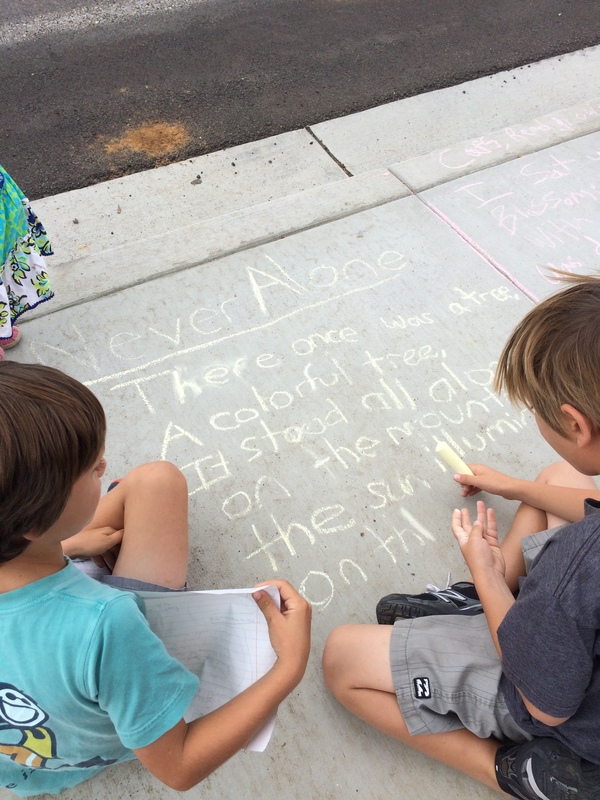 And with sidewalk chalk and their drafts in hand, our writers chalked their poems onto the sidewalk for the public to see and read: a chalk-a-bration! It was fun to watch cars slow down to see what we were doing and people with their dogs stop to admire our handiwork. 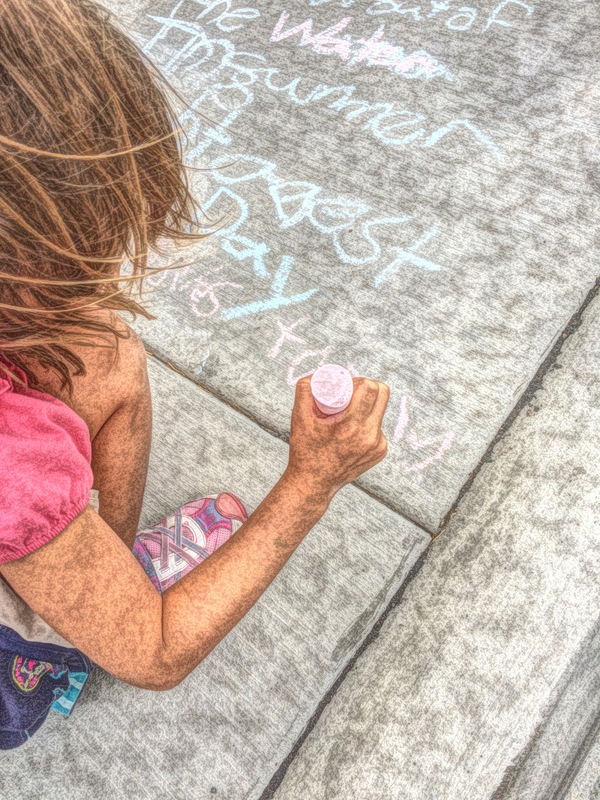 Chalking their poem onto the sidewalk was not as easy as students first thought. There was the dilemma of figuring out which direction to write and how much space it would take. And then applying the right pressure to make the words readable…and even finding a comfortable position to do the writing came into play. 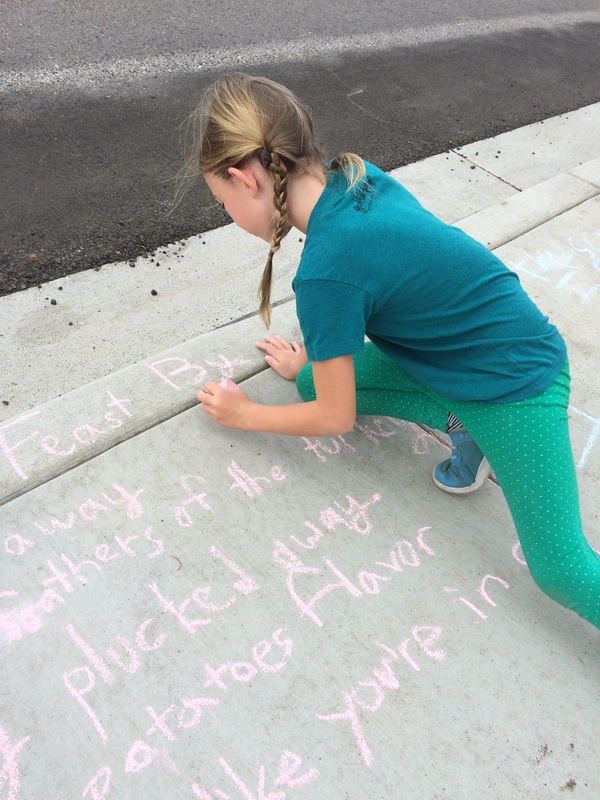 Students began to suggest that we post the written poems on the fence near the sidewalk, realizing that reading pencil on paper might be easier than chalk on sidewalk. We’re looking into the feasibility of the possibility. Our celebration ended with an open mic back in the auditorium. 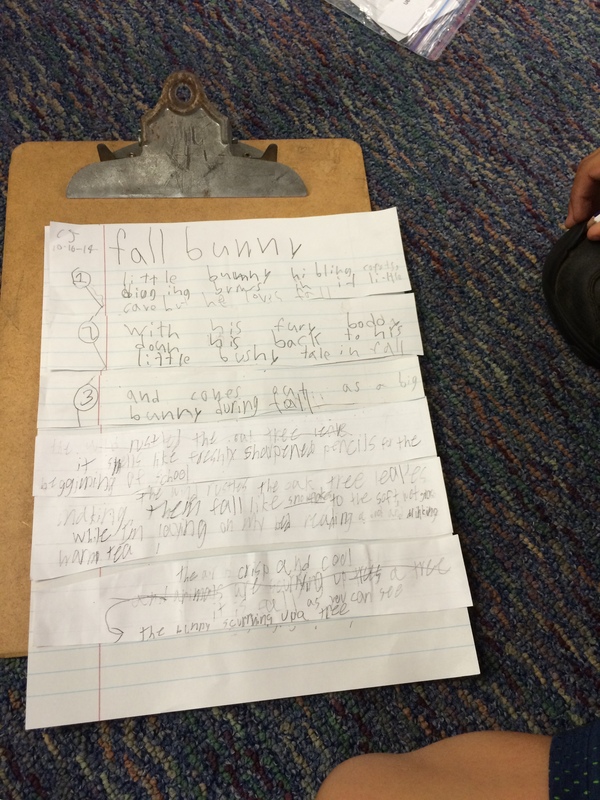 I’m always amazed with how eager our students are to share their writing. We could have stayed for another hour listening to the poems, but had to limit ourselves to a few random poem selections…for now! 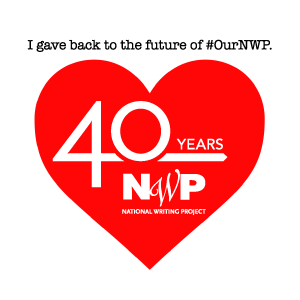 For us, the National Day on Writing is an opportunity to publicly celebrate what we do every day…write. And this year’s theme: write my community, was perfect for us. 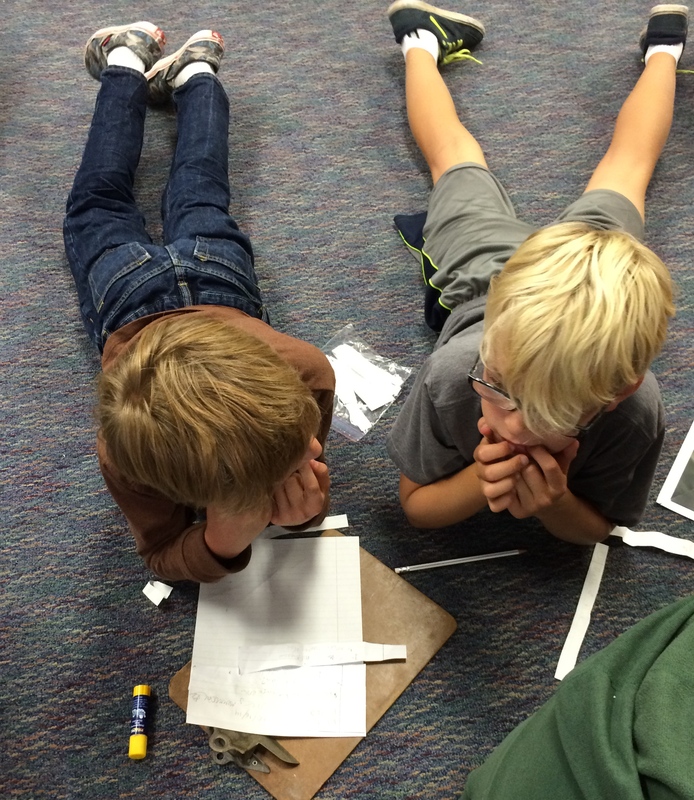 We are a community of writers that extends beyond the classroom and across age and grade levels. We write to learn, to remember, to explain, to share our knowledge, to explore, to convince, to analyze, to reflect, and to express ideas and feelings. We write for ourselves, for each other, and for the public. 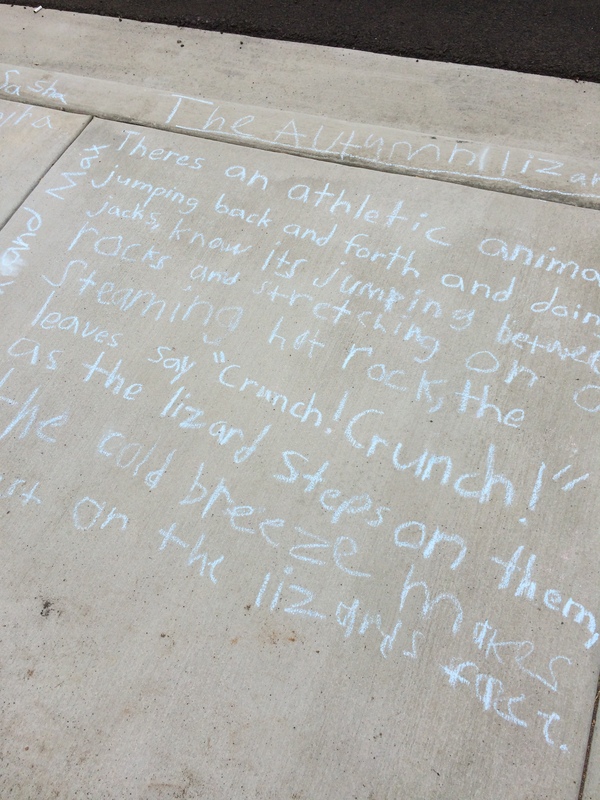 This entry was posted in writing and tagged celebration, chalkabration, community, connected learning, National Day on Writing, teaching, write my community on October 20, 2014 by kd0602.